Happy Friday! How was your week? I've had a busy few days, but I managed to get some sewing in! 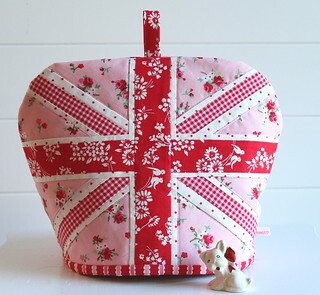 Remember way back when I made the cute Union Jack tea cozy from Lynn's pattern? Well cousin Linda asked me if I'd make her one out of my Pam Kitty Morning strawberry fabric. ( a year ago) I've managed to put it off since my last visit, but this week I made reservations to go back to Minnesota to see Linda and Mark and figured I'd better get busy. I'd forgotten how challenging paper piecing is for me. My brain doesn't want me to get those triangles right. Thank goodness you end up cutting it as I've managed to have two corners where the gingham doesn't go to the edge. But gosh I love the block. I suppose you've seen all the wonderful Union Jacks on Instagram, they're having a Jumping Jacks Quilt Along with Joanna's Jumping Jacks pattern. This weekend hopefully I'll get it finished. It took the better part of yesterday to get this done. By the end my brain said walk away so I did! Not to jinx myself but the rest should be easy enough. Lynn's instructions are great and any problems are my own for sure! But even though it was at times frustrating I loved putting the block together! Making something for someone is super fun. Ok, hope you have a great weekend.. any big plans? See you next week! 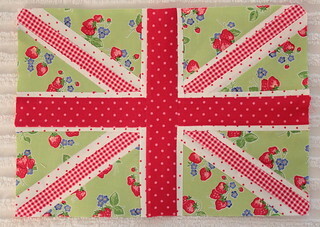 Love your union jack. Lynn's pattern is the one that is true to the flag so I like it the best. Your's is so cute. I love that strawberry print. Any hopes that it might appear again? Maybe with a white background? maybe aqua? I have a bit of the green, my favorite that I can't bear to use. I got my basket blocks, thank you so much! I love the pink. Dang it! I forgot about Lynn's pattern when I started my Union Jack blocks. I really wanted a pattern that had the right proportion on those white stripes (some skinny and some fatter) and Lynn's pattern does that. Your little block is adorable!!! Cutest thing Pam! And I also get grumpy about paper piecing!!! Have a great weekend! Pam, she will love it! Sooooo cute!!! Your block looks great, and those corners are going to be rounded off anyway! A teapot cozy is on my never-ending list of projects!